2 tablets once or twice daily with food or as professionally directed. Not to be taken in cases of manic depression or epilepsy. A unique blend of vitamins, phospholipids and other nutrients to help support the healthy functioning of the brain. The brain’s normal functioning is dependent on a sophisticated communication system between the nerve cells using chemicals known as neurotransmitters. Brain Food® Formula is a unique blend of vitamins, phospholipids and other nutrients to support the healthy functioning of the brain. 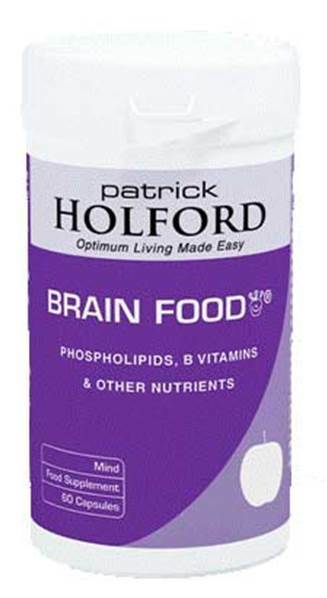 BioCare Patrick Holford Brain Food contains phosphatidyl choline and DMAE, nutrients that are used by the brain to make acetylcholine, phosphatidyl serine and pyroglutamate, important nutrients for neurotransmitter reception, along with vitamin B12, Folic acid and Pantothenic acid which are essential for neurotransmitter production and balance. L-arginine-l-pyroglutamate, dimethylaminoethanol (DMAE preparation with tartaric acid), capsule shell (hydroxypropyl methylcellulose & colours [titanium dioxide & copper chlorophyllin]), pantothenic acid (vitamin B5 as calcium pantothenate), trimethylglycine, phosphatidyl choline (preparation with soya lecithin1 and soya oil1), phosphatidyl serine1 (preparation with vitamin C), anti-caking agent (silicon dioxide), niacin (vitamin B3 as nicotinamide), folic acid, vitamin B12 (as cyanocobalamin).